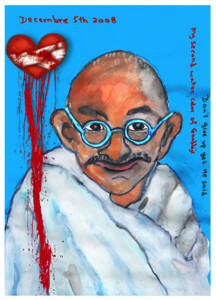 Painting these watercolor portraits of Gandhi helped Malekeh Nayiny find an inner path toward healing. From the Tikkun Daily Art Gallery. 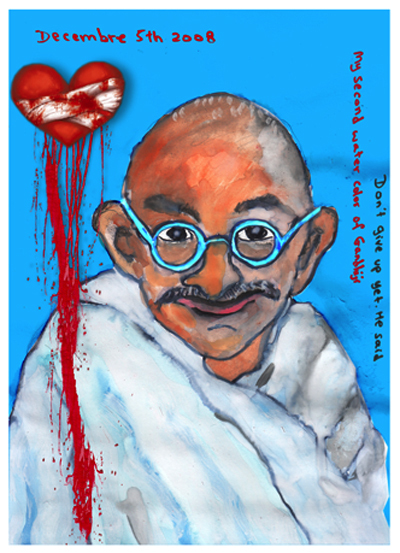 I have been thinking, for years now, about Gandhi’s invitation to be nonviolent in thought, word, and action. 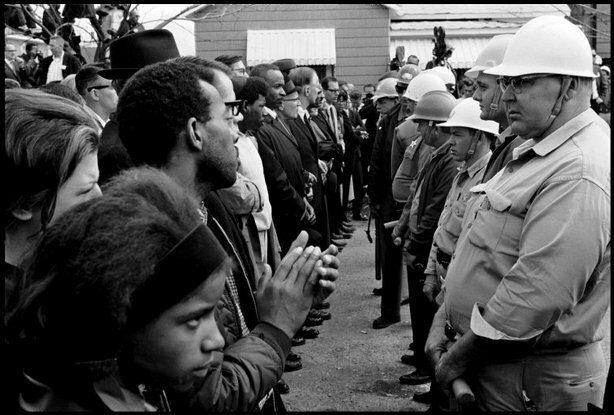 It’s only this past week that it finally dawned on me that in many instances, nonviolence in action is easier than nonviolence in word, which in turn is easier than nonviolence in thought. Many more groups and individuals worldwide, for example, have refrained from physical violence when engaging in social change action while at the same time harboring hatred of those in positions of power. For an extreme example, most people don’t kill anyone even though it’s known that many people entertain fantasies of killing. Our habitual thoughts are deeply ingrained, and require ongoing active and conscious practice to transform. I am not surprised to discover that both Gandhi and Martin Luther King, in different ways, wanted their biggest legacy to be how they lived much more than their external achievements. As I think about what it means to live in a nonviolent way, I keep coming back to the clear insight I’ve had that all of us can be nonviolent when everyone does exactly what we want them to do. The test of our nonviolence is precisely when people do things we don’t like. Whether individuals in our personal life, co-workers, people we supervise, or bosses at work, or those with significant economic, social, or political power – the challenge is the same. Something profoundly changes when we take on loving everyone. This love is of a unique kind. It isn’t about wanting to be everyone’s friend. It’s not even about liking what people do. For me, it’s about two core bottom commitments. One is to maintain complete awareness of that person’s humanity, and therefore uphold their dignity in all our choices about how to respond. The other is to continually aim for solutions that attend to that person’s needs, as best we understand them. Both of these are internal matters, and they tell us nothing about the specific kinds of actions to take in response to what we don’t like. At the same time, those intentions completely affect how we might choose to respond in those times when someone else’s actions are at odds with our own human needs. Any time any of us engages in unilateral action, in some significant way others’ well-being is affected. I have yet to meet a human being who enjoys being coerced. All other things being equal, then, I see nonviolence as closely related to a commitment to non-coercion. This kind of commitment is easiest to maintain in an interpersonal context of equal power and shared willingness to engage in collaborative processes. The parties involved in the conflict can then engage in dialogue, identify everyone’s needs, hear each other, with or without the support of a third party, and arrive at solutions that attend to as many needs as possible, together. That’s what we do with friends, lovers, co-workers, and housemates. The commitment to non-coercion becomes progressively more challenging the more people are involved, the more power differences exist in the situation, and the less willingness we find on the part of those whose actions we are calling into question. It also becomes more challenging the more abhorrent to us the action of the others is. I find it utterly understandable why people resort to terrorism in so many contexts where their level of powerlessness is extreme, the assault on their basic human dignity is profound, the scope of harm being done is extensive, and the prospects of getting anywhere with peaceful means seem so grim. With all my understanding, I am also aware that in precisely those kinds of contexts Gandhi, Martin Luther King, and a growing number of people around the world have found nonviolent ways of responding. What is of interest to me here is the relationship between nonviolent resistance and coercion. If an organized group of activists engages in nonviolent resistance the result of which is regime change, did these people impose their will on those in power? If so, in what way is their action “nonviolent?” If not, what is really going on other than coercion? What has helped me think about these questions is recognizing that the answers by necessity require more delving into the dynamics of power and violence. We all have amazingly robust internalized habits of relating to power that live in us in response to living, for so many thousands of years, in authority-based societies. Those with power are habituated to getting their way, even without an active intent to coerce others. Those with less power are habituated to going along without true consent, often without awareness of having made a choice, and at other times with a clear sense of making a disempowered choice out of fear of consequences. When those with less power remove their willingness to go along, those with power may very well experience it as a form of coercion. One example I came across some years ago was research done on the experiences of divorced men, most of whom didn’t pay child support, and many of whom felt angry and had the experience of being “dominated” by their former wives, when in reality what the researchers believed was happening was a small amount of equalization of power. I view nonviolent resistance in much the same way. It has long been known that even tyrants rule more because of some implicit sense of legitimacy that keeps people obeying them rather than just because of the sheer force of physical intimidation. If enough people, en masse, rise up and refuse to participate, those who rule lose that delicate balance of legitimacy, and eventually must resign. In some small technical sense they are being “forced.” It makes more sense to me, instead, to think of it as rebalancing of power that reshapes the range of options available to the rulers. The option of ruling at the expense of others is simply no longer available when enough people stop cooperating. One of the particular ways that nonviolent resistance works is precisely by undermining the source of support of the rulers. This is particularly evident when members of bodies such as the army or secret police begin to defect rather than continue to support the regime. The more violent the regime’s repression in the face of nonviolent resistance, the harder it is to maintain any semblance of legitimacy. If love is fundamental to nonviolence, what is its place within nonviolent resistance? How can love co-exist with unilateral action designed to change the power balance and reshape the options available to those in power? If we are to love those who hate us, as Gandhi says, or our enemies, as Jesus framed it, the first aspect of love within nonviolent resistance is in how we view those in power. To me, this form of love has an effect on us no less than the effect it has on the other. I remember the years in which I was role-playing George Bush at a time when the overwhelming majority of those who came to my workshops were full of hatred and derision toward him. What was most significant was how I felt my heart growing and growing as I learned, viscerally, to have more and more understanding for his experience and some of his choices. I never changed my mind, never came to like choices that I imagined would be disastrous, and yet my inner experience was dramatically altered. I want us to be able to see the humanity of everyone, including those we would ultimately want to incarcerate to maintain everyone’s safety. As a corollary to opening our hearts to seeing the humanity of the person whose behavior we want to change, we naturally develop an interest in their well-being, and an intention to work for an outcome that includes their needs. Even in the absence of dialogue, even through transforming societal structures, even if it means they experience loss of power, we can aim to address the fundamental human needs of our enemies. In the long run, unless we find a way to attend to everyone’s needs, we will perpetuate war. I find it tragic that so many people who engage in nonviolent action remain nonviolent only in action, and continue to engage in forms of speech, and certainly thoughts, that are dehumanizing of those in power. Love features in nonviolent resistance in one more way. In some way, nonviolent resistance is the only nonviolent option available when those in power don’t respond to an invitation to dialogue. At least some of the time we can even view nonviolent resistance as the action necessary to re-create the conditions to allow dialogue to happen. Gandhi and many other leaders were always ready and willing to engage in dialogue even while putting enormous pressure on those in power by mobilizing masses of people to participate in nonviolent resistance. Even when our hearts are open and when we are able to choose a path that holds active care for the needs of those who oppose our goals, to whatever degree we achieve our aims without their active and willing participation, we run the risk of breeding resentment and the rise of eventual counter-movements. A world that works for me and not for some people in power is no better than the world that works for them and not for me. What I want, what the love implies, is envisioning, engaging in dialogue, and even organizing nonviolent resistance in order to create a world that truly works for everyone, even our former enemies. I think that it’s great that you seem to know and have so much to say about Nonviolent Communication, nonviolent resistance and nonviolence in general. What I would like to know is – why are you not in Israel applying all of this to the situation there? There are many reasons I am here and not in Israel. The relevant point to what you are suggesting is that I very clearly lack the skills, including a certain capacity to build connections, to be able to organize any kind of campaign. Simply not what I see as my strength, nor what I am drawn to. Thank you for your response, and I respect where you're at. I also appreciate your honest self-assessment of where your skills are and are not at. I would like to know why Ian is so keen on getting rid of you, Miki? Just kidding!